A tandem repeat in DNA is two or more contiguous, approximate copies of a pattern of nucleotides. Tandem repeats have been shown to cause human disease, may play a variety of regulatory and evolutionary roles and are important laboratory and analytic tools. 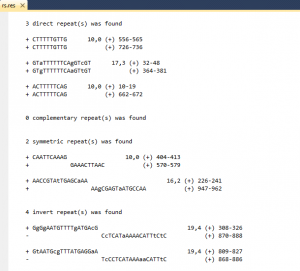 Extensive knowledge about pattern size, copy number, mutational history, etc. for tandem repeats has been limited by the inability to easily detect them in genomic sequence data. In this paper, we present a new algorithm for finding tandem repeats which works without the need to specify either the pattern or pattern size. We model tandem repeats by percent identity and frequency of indels between adjacent pattern copies and use statistically based recognition criteria. We demonstrate the algorithm’s speed and its ability to detect tandem repeats that have undergone extensive mutational change by analyzing four sequences: the human frataxin gene, the human beta T cellreceptor locus sequence and two yeast chromosomes. Symmetrical – two (l,k) segments are located in opposite orienation in a single DNA strand;. Direct complementary repeats – two segments are located in the same orientation in different DNA strands;. The program is destined to visualise the results of repeats search by ReSearch program, and is included in OligoRep program. various types of repeats (direct, symmetrical, direct complementary, inversed) are plotted by various colors. 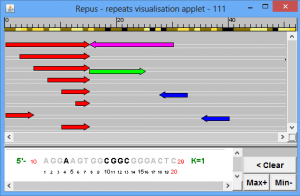 How it works Pressing “Visualisation” button the reuslts of repeats search in target sequence are visualised. By mouse double -clicking the particular repeat structure and content is visualised separately.